At the top of the page, click "Click here for a Virtual Library Card." On the form which appears, fill in the fields such as name, street address, email address, phone number and your preference for Library contact (mail, email, phone or text). Choose a password and enter it twice; be sure to remember this password or PIN. Click Submit. 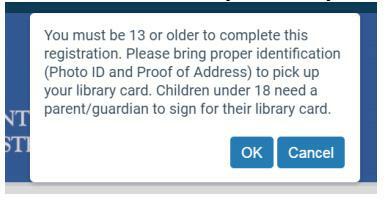 Your Virtual Library Card number is PACREG followed by six digits (PACREG******). Your PIN is the password you chose on the registration form. You will be able to use this number and PIN for some of the Library’s online services. To access all of the Library’s services, go to your home library with a photo ID and proof of residence to get your physical library card.